A lot of people will tell you they don't like sunscreen, even though we're cautioned to use it all the time. However, the reality is that commercial sunscreens are extremely dangerous, full of petrochemicals, nano-particles, and titanium oxide (a heavy metal). The spray-on form you see people slathering their children with is alcohol based and highly flammable. Below is a sunscreen product formulated by a Stanford-trained biochemist whose specialty is dermatology. It is a physical mineral sunscreen, containing body-friendly zinc oxide, and not in nano-particle form. Its rich carrier emollients are actually food-grade, blending the sunscreen nicely into your skin (in the tinted forms). The skin is the body's biggest mouth. The stuff you put on it gets quickly absorbed, especially if it is nano-sized. Contrary to popular belief, the majority of chemicals are not tested and approved before being used in everyday products. Consider the dyes, fillers and perfumes in commercial detergents, leaving residues that invariably end up on our skin, to say nothing of polluting our world when they run down the drain. So check out our 100% organic, biodegradable Himalayan soapberries -- fantastic natural alternative to laundry detergent! You'll be amazed at how well they wash your clothes! We pride ourselves in "staying healthy" without understanding how full of toxins so many conventional products are. In fact, notes the biochemist who made the Kabana line (below), "Just one ounce of commercial sunscreen is enough to undo years of organic eating!" Think about that before you run off to the beach or the golf course! Also check out Kabana Magnesium Cream (scroll down) -- five stars for this one! Based on a real Indonesian formula, Bali Bloc is a heavy-duty sunscreen stick for water lovers and for kids! Tinted dark (not recommended for the fair and freckled), Bali Bloc is SPF 30 - in rugged stick form and very water-resistant. 100% organic, a simple 4-ingredient mix of coconut oil, cocoa powder, beeswax and zinc oxide - smells incredible! Non-nano; no phthalates. Bali Vanilla - white zinc oxide sunscreen stick that smells like natural vanilla! Same product, minus the tint: blends nicely with paler skin tones. 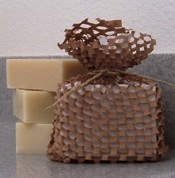 Easy to use for kids, who love the chocolate and vanilla scent...no more struggling to put on sunscreen. Popular as a pain-relief remedy for sore muscles and stiff joints, magnesium chloride spray (a.k.a. magnesium "oil") is a 33% brine (saturated solution) that also transfers essential magnesium into your body. 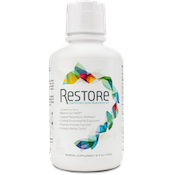 A great way to supplement oral magnesium, and topical/transdermal application also delivers magnesium's muscle-relaxing effect exactly where you want it. Anti-microbial, you can also use this as an inexpensive and extremely efficient underarm deodorant (will sting on the days you shave)! Try our new magnesium chloride gel! Simply formulated using a natural cellulose as the gel base, this 33% magnesium-chloride concentration dries quickly, contains no oils and can also be used as an underarm deodorant (not recommended after shaving). Use liberally to relax muscles and combat stiffness and pain. Our body needs magnesium as much as it needs iodine (see Health tab). An electrolyte that serves as a mediator in many biochemical processes, magnesium also relaxes tissues, alleviating muscle and joint pain. Essential for proper neurological functionality, the most effective uptake method for magnesium is transdermal, or through the skin. A very basic, very effective way to control odor and supply vital magnesium to your body! Magnesium chloride is anti-microbial, unscented and non-staining, and applied under the arms works fabulously as a deodorant. Over time, users report "not smelling at all," as regular use changes the underarm biome such that odor-causing bacteria simply stay away! A very versatile soap/shampoo with a 30-year history - great for sensitive skin or anyone who likes that super-clean feeling! Miracle 2 (or II) has become legendary, and devotees use it for nearly everything, including dishes, carpets and pets. It lathers like crazy...seems to work better than commercial shampoo; super gentle, soothes dry, chapped skin and many recurrent skin conditions (e.g., eczema). See "Miracle II testimonials" on the Internet to learn more; there are other products in the line but the fantastic original liquid soap is what we offer here. A light all-over lotion with a green, earthy scent ("olivander"), made of 100% natural ingredients. These include extra-virgin olive oil, olive leaf extract, aloe vera gel, avocado oil and shea butter. Also available unscented.